Her Universe Founder Ashley Eckstein, on the runway from last year's Her Universe Fashion Show, returns as host of the 2016 show being filmed for a docu-series to air on the new Comic-Con HQ channel. The Her Universe Fashion Show, the ultimate runway for fangirl fashion, returns to the world’s premiere comic book and popular arts convention, San Diego Comic-Con, July 21st 6:00pm at the Manchester Grand Hyatt Hotel. This year, in addition to submitting designs online, designers in the Southern California area will have the opportunity to submit their geek couture fashion concepts in-person to a panel of judges from Her Universe and Hot Topic at Hollywood and Highland in Los Angeles on April 23rd beginning at 10am. Designers from all over the country are welcome to submit and will also have the opportunity to submit video explanations of their designs if they cannot attend the open call. Twenty-five designers will be selected to compete in the Her Universe Fashion Show at SDCC for the chance to win the opportunity to design a fashion collection with Her Universe that will be sold at Hot Topic – the leading pop culture retailer. This year is extra exciting because the entire process will be filmed for a docu-series to air on the new Comic-Con channel, Comic-Con HQ. This third annual must-see “geek couture” fashion show once again offers fans and amateur designers, male or female, the opportunity to submit their own women’s fashion designs based on anything that is celebrated at Comic-Con, original or inspired by popular media. The design competition submission process is OPEN NOW and designers, 18 years and older, can submit designs to be considered for the fashion show online HERE. All applicants must enter online even if they attend the in-person open call in Los Angeles. The deadline for submissions is 11:59pm PST on Sunday, April 24th, 2016 and the twenty-five finalists will be selected and notified by Wednesday, April 27th, 2016. “We always put the fans and community first at Her Universe and the fashion show is an example of our mission,” added Michael Rego, Chief Executive Officer of The Araca Group, Eckstein’s partner in Her Universe. The Her Universe Fashion Show will be hosted by Eckstein with an all new group of aspiring designers, from a variety of backgrounds and experiences, who will present their original "geek couture" designs on the runway. There will be three winners chosen at this year’s fashion show. The third winner will be chosen by the Comic Con HQ viewers at home. Eckstein will be an Executive Producer for the docu-series along with Blondie Girl Productions owned by Ashley and Jennifer Tisdale. All media inquiries including attendance and coverage of the fashion show should be directed to Her Universe publicist Dan Madsen at dmadsen(at)araca(dot)com. Hot Topic, headquartered in City of Industry, CA, was the first retailer to make alternative apparel and accessories available at malls across the country. Today, Hot Topic is the fandom haven for guys and girls obsessed with music and all things pop culture. Founded in 1989, Hot Topic operates 680 stores in the U.S., Canada and Puerto Rico and an online store at hottopic.com. Find Hot Topic on Twitter (twitter.com/hottopic), Facebook (facebook.com/hottopic), YouTube (youtube.com/hottopic), Instagram (instagram.com/hottopic) and Snapchat (hottopic). Founded by Ashley Tisdale and run by Ashley and her sister Jennifer Tisdale, Blondie Girl Productions is a Los Angeles based production company that develops and produces television and digital programming with a focus on women. Blondie Girl is one of the producers behind FREEFORM’s breakout comedy hit “Young & Hungry” which is heading into its 4thseason and can also be seen on Netflix & HULU. Blondie Girl’s focus is to place an emphasis on female characters that defy expectations as well as creating stories that surprise and entertain its fans. You can find Blondie Girl Productions on Twitter (https://twitter.com/BlondieGirlProd), Facebook (https://www.facebook.com/BlondieGirlProductions ), Instagram (https://www.instagram.com/blondiegirlproductions), and Snapchat (blondiegirlprod). 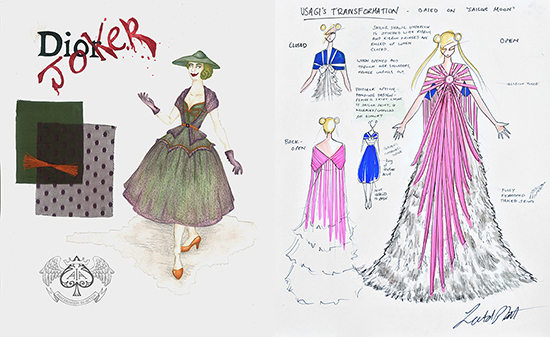 Original sketches from last year's winning fashion show designers, Kelly Cercone (Joker's New Look) and Leetal Platt (Usagi's Transformation). Designer Kelly Cercone models her own geek couture design, Joker's New Look: Batman, which won last year's Judge's Choice in the 2015 Her Universe Fashion Show. Chloe Dykstra models last year's Her Universe Fashion Show Audience Choice winning design, Leetal Platt’s Usagi's Transformation: Sailor Moon. Sneak peek of the new Force Awakens collection coming soon to Hot Topic. 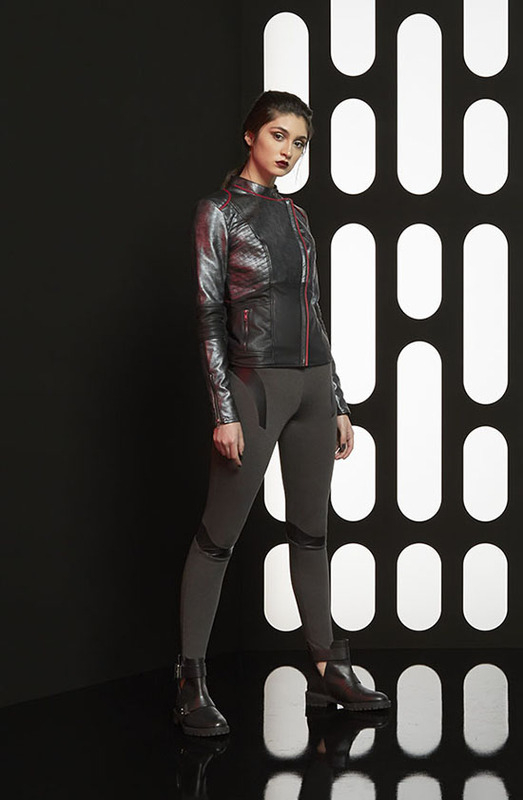 Captain Phasma jacket & leggings designed by last year's fashion show winners Leetal Platt and Kelly Cercone. Image: Hot Topic. 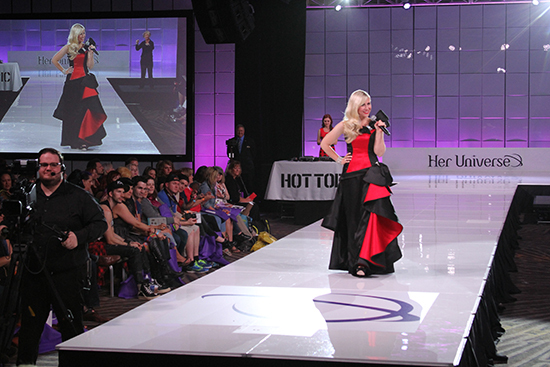 Her Universe Founder and host Ashley Eckstein on the runway from last year's Her Universe Fashion Show. Eckstein returns as host of the 2016 fashion show. The popular Her Universe Fashion Show returns to the 2016 SDCC - this time being filmed for a docu-series to air on the new Comic-Con channel, Comic-Con HQ.